The Cladinox process is based on experience developed over a period of forty years. It is a significant improvement on A. Cacace’s USA patent (2004) no: 6,706,416, which is believed to be the only technology to date to have successfully produced stainless-clad bars commercially. More than 2000 tons have been produced in the UK and sold into the USA. The Cladinox technology can also be applied to cladding alloys other than stainless steel to achieve optimal properties more economically such as appearance or corrosion or wear resistance for the cladding, combined with desirable core properties such as high tensile strengths and lower costs. For example, nickel-chrome or copper-nickel alloys can be used as cladding materials. Cladinox billets can be prepared for trials to suit potential licensees’ rolling mills. This “new material” at the interface is actually stronger than the stainless steel itself because of the stronger carbon steel atoms now contained. It means that Cladinox can never de-bond such as sometimes occurs with conventionally clad plate during heat treatment or during welding. Across an “intimate” & inclusion-free interface of 2 solid metals; atoms diffuse between each other at different rates, with heat, pressure & time. For example, brass, which is zinc & copper’s alloy, grows in the direction of the faster diffusing species. Thereby creating a metallurgical bond between the 2 solid metals whose integrity or “strength” depends on the “cleanliness” of the interface between the 2 metals and on the atoms comprising this “Transition Zone” or bond. Because hi-tensile CS is stronger than austenitic SS, the Transition Zone is therefore stronger than SS. Cladinox’s unique scavenging/vacuum-forming technology creates the ideal inclusion-free interface conditions between CS & SS, across which atomic diffusion can occur to result in a perfect metallurgical bond. Despite having been rolled through only 6 passes the shear bond strength tested showed “perfect” bonding, by almost equaling the stainless steel cladding's ultimate shear stress of 480MPa, with a cladding/core interface bond stress averaging 460MPa. Its shear strength is furthermore well in excess of the minimum requirement of 140 MPa specified in the AASHTO MP 13M/MP 13-04 Standard Specification for “Stainless Clad Deformed and Plain Round Steel Bars for Concrete Reinforcement”. 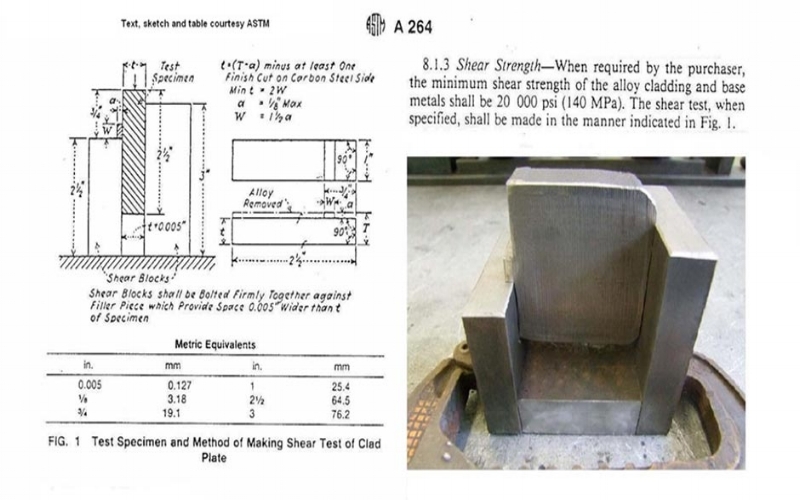 The AASHTO MP 13M/MP 13-04 Standard Specification (please click to link to info regarding this) "Stainless Clad Deformed and Plain Round Steel Bars for Concrete Reinforcement" requires a minimum bond strength in shear of 140MPa when tested according to ASTM A 264 - the specification for stainless chromium-nickel steel clad plates. An accredited testing laboratory conducted tests on two sections of a Cladinox rolled square in accordance with the ASTM A 264 indicated methodology. CLADINOX SCR IS HOT ROLLED THROUGH 18 ROLLING PASSES FROM A 6” CLADINOX BILLET. Shear Stress Curve for Sample 1 showing an ultimate shear stress of 303 MPa. Note ductile fracture characteristics from curve. Shear Stress Curve for Sample 2 showing an ultimate shear stress of 319 MPa. Note ductile fracture characteristics from curve.